In the fiercely-competitive world of basketball, players know only too well to seize any small advantages that may come their way – even if the edge happens to come from hair loss. Teenage basketball ace Sammy Richardson from Nebraska started losing his hair to the autoimmune disorder alopecia universalis when he was in second grade, and whilst this often-distressing condition which causes total hair loss on the head and body initially knocked him for six, Richardson says he quickly got used to it. Today, in fact, the six-foot-three leading scorer for the Lincoln High team in the city of Lincoln, says that his completely bald head sometimes gives him a small competitive advantage when he is facing players who don’t know him. Richardson thinks that his smooth-headed look may give him a slightly intimidating vibe – although he admits that now people have got used to seeing him around, most people he encounters are not phased by his lack of hair. Even so, over the years the young player has had to put up with numerous questions about his bald head, most of which revolved around whether or not he was having treatment for cancer. Alopecia universalis is a rare and virtually untreatable form of the more widespread alopecia areata, although the latter is far from commonplace and will only affect around 2% of all people in their lifetime. Categorised as autoimmune disorders, both conditions are thought to have multiple suspected triggers. What is especially brutal about alopecia-related conditions is that they can strike without warning and that no one ever knows whether regrowth is just around the corner. At Belgravia, alopecia areata treatment is possible when clients present with the scalp-only, mild, patchy version of the disease, and tailored treatment courses typically involve formulations of high strength minoxidil from those available at the in-clinic pharmacies. 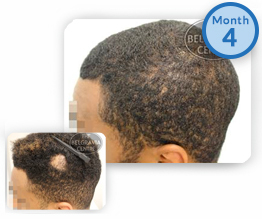 This approach can often produce improved results, examples of which can be seen in Belgravia’s Alopecia Areata Treatment Success Stories gallery. More proof that severe alopecia need not be a barrier to personal and professional success can be found in spades in sports circles around the world, with everyone from gold-medal winning British cyclist Joanna Rowsell to footballer Jonjo Shelvey affected by the condition. Like many others with the disease, they have spoken publicly about their struggles to come to terms with their extreme hair loss and have proven to be an inspiration for many.